"What does it mean to you to 'do good'? What does it mean to 'do evil'? How can you be a catalyst for positive change in your sphere of influence?" If you haven't heard of them, take a look at their site and especially read their mission statement. They have such a unique and encouraging voice in an industry full of comparison and competition. Well anyway, here are some photos from that evening! I was not given a ton of guidelines on this event, the only thing they asked is that it was "clean and simple". 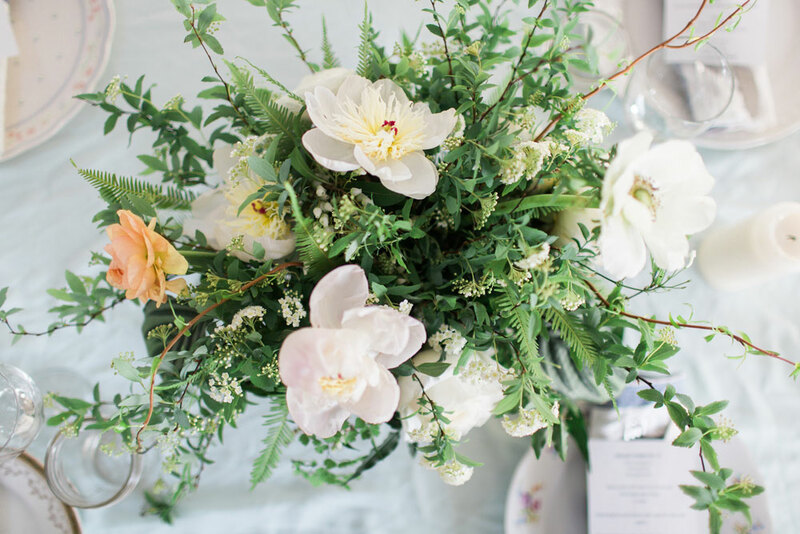 I immediately had this vision of lush greens paired with minimal, but striking, florals. I guess that is a pretty vague vision. When I know the vibe I want to convey but cannot pinpoint exactly what product to use, I shop the LA market. I usually order in advance from a local wholesaler, but that can be challenging at times because you are putting an arrangement together in your mind. In LA you can tangibly pick up bunches and see how the colors and textures compliment each other. Plus, ordering "peach ranunculus" can vary ever so slightly between "peachy pink" to "peachy yellow" and that is a risk this perfectionist just cannot take. Japanese spirea is what saved and made these larger arrangements. It was $40 (yes, for just ONE bunch) but so worth it. I saw it and knew that was what I was needing for a base to build upon. It was more delicate than local spirea, less branchy. That combined with the greening curly willow,umbrella fern and pieris- yes. Then I found these peonies that really made the entire piece just sing. I was so grateful to Kara and Darling for allowing me creative freedom to transform this space. I learned a lot, that greenery can always make a strong impact and to trust my instincts more. I hung the greens from the ceiling on a whim and loved what it added to the ambiance. Thank you Darling Magazine! All of these photos were taking by Brooke of Poiema Photography who as always, captures the beauty of events so magically.